The protest was organised at the decision to close the emergency department at Roscommon hospital, which is be replaced by an ‘urgent care centre and medical assessment unit’ from Monday. 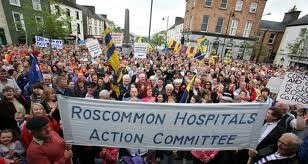 Busloads travelled to Dublin to voice their protest at the elimination of hospital services from the sprawling western county of Roscommon. Some carried white crosses, while others held aloft homemade placards. “To hell or to Connaught,” read one. “This is a matter of life and death,” said another. Roscommon TD Denis Naughten addressed the protesters prior to a parliamentary vote on a motion by Sinn Fein to retain emergency services at smaller hospitals. After the vote there were cheers at the announcement that Mr Naughten had voted for the motion, but there were boos as the crowd heard that another Fine Gael TD, Frank Feighan, had voted with the Fine Gael/Labour government. Naughten was immediately expelled from the Fine Gael parliamentary party as a result of voting in favour of the Sinn Fein motion. Sinn Fein TD for Cork East, Sandra McLellan said her community’s worst fears had been confirmed by the news that Mallow General Hospital is also to be downgraded to an urgent care centre and medical assessment unit from November 2011. She said the ‘Roscommon model’ would mean a huge reduction in services. “This is a move which has been signed, sealed and delivered by the new government. “Last night we in Sinn Fein provided Government TDs with the opportunity to avoid this outcome. They chose not to. She said patients would now be expected to go to Cork University Hospital in Cork city, the most overcrowded hospital in the State. On Wednesday, newly appointed head of the International Monetary Fund, Christine Lagarde, spoke of the “courageous decisions” being made by the Dublin government in order to meet the austerity targets laid down by the IMF and European Union finance officials. Senior officials from the European Union and the International Monetary Fund are currently in Dublin to carry out the latest review of the government’s adherence to the 67 billion euro bailout loan. Profits accruing to the EU/IMF loans to Ireland could be worth up to 9 billion euro over their lifetime, Minister for Finance Michael Noonan has admitted in the Dublin parliament, describing them as “excessive”. Sinn Fein finance spokesman Pearse Doherty pointed to exchequer figures which he said showed that “just over 20 per cent of all taxes collected in the State are now needed to pay off the interest on our national debt”. He said the figure would increase because servicing the national debt would cost 5.2 billion euro this year and increase to 9.2 billion euro by 2015. Mr Noonan also confirmed that “next year is going to be difficult”. It also emerged that a disastrous agreement negotiated by the former Fianna Fail/Green Party government means that Dublin must pay a large annual fee to the British Treasury even if it doesn’t draw down the amount allowed under a separate bailout loan. To avoid the charge, #800m must be borrowed this year, followed by #1.6bn next year and #800m in 2013. Under the agreement, the British government has also covered itself against the chance that Ireland leaves the euro or even the European Union. If this happened, British loans would have to be paid back immediately, and in sterling, not in euro or any new Irish currency, the agreement states. The 26-County state is a major importer from Britain and any policy which might lower the value of those imports, such as through a currency devaluation, would represent a major setback for British industrialists. Also disclosed in the legal agreement, which has been lodged in the House of Commons and put on the Department of Finance website, is that the London government may send representatives to the 26 Counties at any time to audit the country’s financial position, partly reversing the independence the state gained from Britain in 1921. A programme of protests and other events is taking place to coincide with the visit by the EU-IMF delegation to examine the State’s finances. The teams, comprising more than 20 officials, will be in Dublin for eight days. The ‘Enough’ campaign, which wants a referendum on the austerity programme, plans a series of demonstrations focusing on cuts in education and special needs assistants, bus services and the public service during the 10 days of the EU-IMF mission. Announcing the planned protests, People Before Profit TD Richard Boyd Barrett likened the bailout deal to the US bombing of Vietnam in the 1960s. Mr Boyd Barrett called for an uprising of people power against the “cannibal logic” of the austerity programme. He claimed the size of protests against the bailout would escalate as cutbacks started to bite.